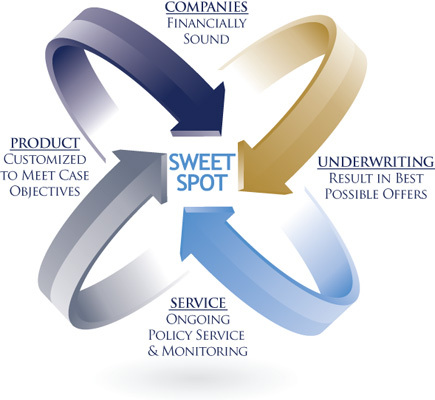 Howell Insurance Advisors "The Sweet Spot"
The process developed by Howell Insurance Advisors, LLC in collaboration with ValMark Securities, positions clients in the "Sweet Spot." Coverage is underwritten by top,highly regarded, financially sound companies. Competitive underwriting results in the lowest possible cost. Policies are customized and designed to satisfy the case objectives. Service, including ongoing service and monitoring the policies, is designed to keep the insurance program on track. Agents have typically promised much more than they have delivered over the years. They sold policies from sales illustrations based on unrealistic assumptions regarding, for example, earnings rates on variable life. Any agent in the Yellow Pages can print out a sales illustration showing premiums based on "super preferred" rates. A very limited number of agents around the country can actually deliver a fully underwritten and approved insurance portfolio at the lowest possible negotiated rates based on the client's underwriting qualifications.